If you’ve been following me for sometimes, you must have mistaken me for an advocate of equality between Bsc and HND. Well, you can be right about me. In fact, I don’t see anything wrong with that. If you must know, Nigeria is only lost in her old ways of doing things. Nothing is practically right with a Bsc holder that is wrong with his HND counterpart. That’s not the point of this piece anyway. I write to update you on the latest trends regards the abolishing of HND/BSC dichotomy as recently said/passed by the Federal government. There have been some misunderstandings which I choose to bring to your attention too - having got the same from the Head of Civil Service of Federation (HOCSF), Mrs. Winifred Oyo-Ita. 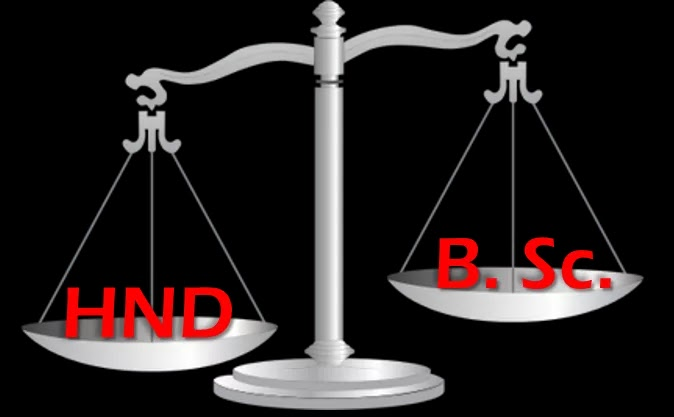 Generally, all Higher National Diploma holders are aware that the salary scale for the Bsc and HND is nowhere near each other. Positions and promotions are suffering the same fate. This issue is not only experienced in the private sector, where it could be forgiven, but also at the Federal, State and Local government establishments. In the her to bridge this gap, the Federal government has recently taken some steps among which include the Discontinuity of HND programme in the Federal Polytechnics and affiliation of Polytechnics with established universities for Direct Entry admissions. Head of Service of the Federation, Mrs. Winifred Oyo-Ita, in a circular dated March 26, 2018, conveyed the decision of the National Council on Establishment to all concerned and solicited their supports through its implementation. Then, several news including The Suns, TribuneOnline etc had it that, the Federal Government has successfully abolished the dichotomy finally. However, a new update has it that Federal Government has not abolished this dichotomy in its entirety. The Dichotomy between Bsc and HND is still Alive. Mrs. Winifred Oyo-Ita threw another bomb when she said the establishment only affect the entry point into the federal civil service. This may conform to the information earlier stated. The council approved entry point of GL 08 for Higher National Diploma (HND) holders in the civil service. It also encouraged serving HND officers to fulfill all specified conditions as contained in scheme of service and extant rules for career progression beyond SGL 14. So, what do we believe now? Nigeria can be a confusing country sometimes. Everything is working against the public. You don’t know what and who to believe. The news says something, the body involved says another. Lots of misunderstandings in short! Meanwhile, ignorance or misunderstanding of law is no excuse. We need to take a stand the stand we take is better that of the authority in charge. Henceforth, HND graduates will enter at the same level GL08 as degree holders. Hence, they will be on the same level at entry point in the civil service. HND graduates in the federal service will progress to Grade Level 14 at maximum. Hence, HND holders who wish to progress beyond GL14 must have met with specific conditions during his working time. HND graduates will not get up to Grade Level17 in the Public service unless those conditions are met along way. Hence, HND holders still have to convert after having acquired relevant degrees, to the officer grade. What are the Conditions HND Holders must Meet before Progressing beyond GL14? The head of service was not detailed as to conditions to be met on or before grade level 14, if HND holders will compete with Bsc counterparts at the levels beyond. This must be detailed, however, in the scheme of employment into the federal civil service. However, it is obvious that they want you to acquire degree or equivalence academic programmes before your time is due for promotion beyond GL14. On this note, you may want to consider NOUN as an alternative to full-time degree, top-up degree programmes or upgrading your HND to Bsc or higher. What is the position of State, Local and Private Sector on Development? Even though the federal government is taking her own steps to bring things to the same level and having passed all bridges to this point, will state, local and private establishment do the same? Federal has not mandated it for other sectors or organs to comply, at least not yet. Hence, we may need to wait some years before they may be embracing this development. There is no doubt about it that, some forces including a part of the Federal Executives, National Assemblies etc are hindering the movement to equate HND with Bsc in all ramifications. This is why it takes century to get here. If more pressure is continually mounted on these officials in the future, this is not far from being achieved. In the meantime, all the concerned should understand their stands and act accordingly.